So this week Polish Hoarder Disorder's challenge was to use the "sponge" technique for something summery. I have been thinking about what I was going to do all week and it finally hit me...a margarita manicure! First of all I love margaritas AND Jimmy Buffet's Margaritaville. Sipping on a tasty marg on my porch, the lake or a restaurant patio just says summer to me. Plus every Margaritaville location is somewhere tropical and happy (I have it on my bucket list to visit every single one). I hadn't tried the sponge technique before but it's pretty easy - even though I just did the tips. 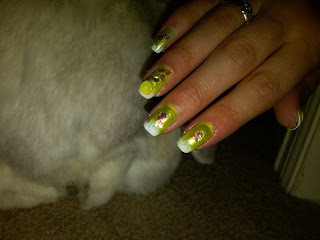 I did a BC, two coats of Sinful's Neon Melon then two coats if Nicole by O.P.I. Make Mine Lime. I then used a face sponge from Sally's to add my rim of "salt" to the tips using Sinful Snow Me White. 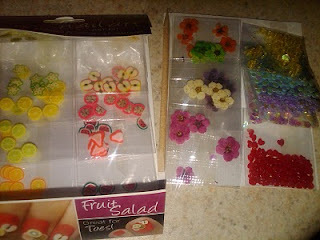 I also picked up some fun little Cina Nail Creations fruities and sequins from Sally's for the "ice" and limes. The last picture my husb tried to take with our little Aspen bunny since she's soo stinkin' cute but she had other ideas, ducked her head and ran away =). Well it's definitely 5 o'clock here so I'm off to my own little Margaritaville! There is a Margaritaville here in Orlando, but Orlando isn't exactly tropical about 40 minutes from the beach! I LOVE LOVE their "Volcano Nachos". Have you tried those? They are soooooooooo good!!!! Cute nails!!! I love the margarita theme very clever to add that "rim of salt" on your nails! Well done! Luv the margarita theme. the Salt rim is a great touch! I'm so in love with this whole post! I love margaritas, live by the Orlando Margaritaville, and live with 2 bunnies! Thanks Beata! Sponging was much easier than I had anticipated. Thanks Lily and Susie! I'm pretty sure I've already entered but am happy for a reminder.